We are running 'Codefest' this Easter, a software development technical event helping students to progress and use the latest technologies. We are hoping to raise £180 to fund multiple Raspberry Pi 3 B+ to be awarded to the winners of the Easter event, which takes place on 27th March 2019. The event exists to encourage students to apply their Software Development skills in a less formal learning environment. In addition, Codefest promotes teamwork and peer learning. The event also allows introducing cutting-edge topics and use of latest technologies that otherwise would not be possible to cover as part of the main curriculum. Codefest has been running every month since October 2018. If the minimum amount is hit, the Codefest winning team will be awarded small computing accessories, such as mice, memory sticks, etc. 1. Donors will receive a public "Thank you!" on social media. 2. 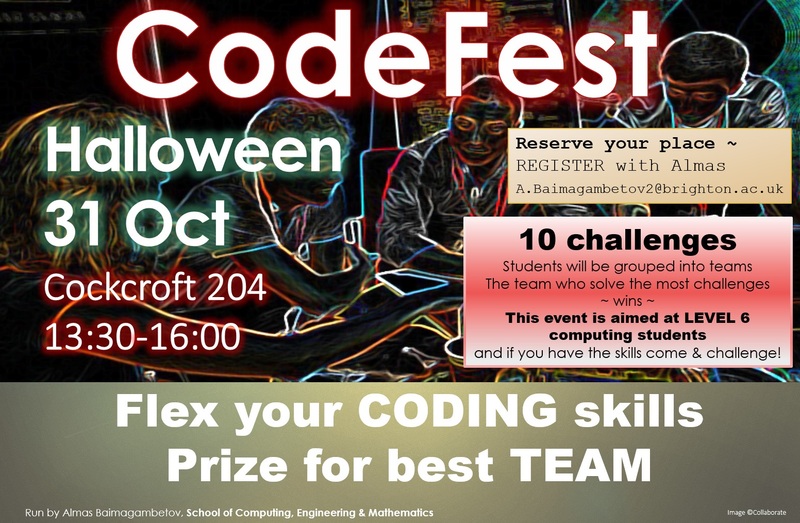 Donors will be able to participate in the Codefest and solve challenges together with students. 1. Donors will receive a public "Thank you!" on social media. 2. Donors will be able to participate in the Codefest and solve challenges together with students. 3. Donors will be able to set own programming challenges for students to solve.